Yesterday afternoon there were quiet rumblings that a deal might get done with the St. Louis Blues, but nothing came of it. Instead, the reaction around the league seems to suggest that the Lightning are just as fed up with Drouin as he is with them. 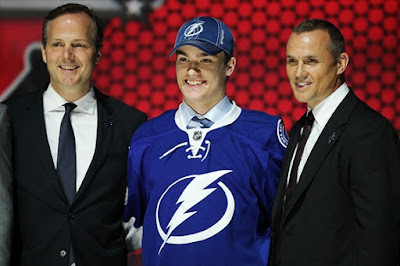 If it gets any worse, Yzerman could refuse to deal him for an extended period of time. But right now it's hard for anyone to get a read on the situation as I'm sure both sides are angry and trying to calm themselves down. In all likelihood, cooler heads will prevail and Drouin gets dealt some time in the coming weeks. St. Louis, Minnesota, Nashville and Anaheim continue to look like the frontrunners. Several Eastern Conference teams have expressed interest - including Montreal and Ottawa - but they aren't likely to convince Bolts GM Steve Yzerman to trade within the Conference. The longer the frontrunners continue to hum and haw about making a deal, the greater chance a sleeper team emerges as a potential landing spot. Sounds like the Hurricanes are still hoping to move young winger Jeff Skinner before this year's NHL trade deadline. Cam Ward and Eric Staal are both trade candidates, but the latter is currently dealing with a concussion, while the former is hoping to re-sign with the team. Another smaller name that is drawing interest is veteran defenseman Ron Hainsey. There is some question as to whether the Hurricanes are buyers or sellers, as they remain in the Eastern playoff race yet are a franchise for sale that needs to cut costs. A lot of talk lately has been about what the Islanders do with pending UFA winger Kyle Okposo. Most suggest GM Garth Snow will try to get him re-signed, but isn't worried about losing him to free agency. If the Isles do in fact sign him, a few rumblings suggest that centerman Frans Nielsen could be dealt for immediate help before the deadline.